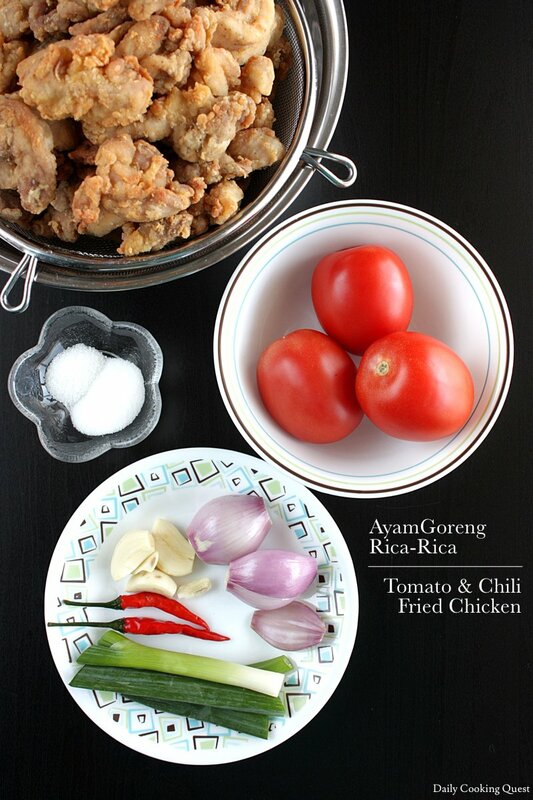 Rica-rica is a famous spicy sauce used widely in Manado cuisine from the province of North Sulawesi in Indonesia. The first time I tried this sauce in a Manado restaurant, my tongue went numb and my eyes couldn’t stop tearing. I even ended up with a stomach upset from all the chilies. But don’t worry. 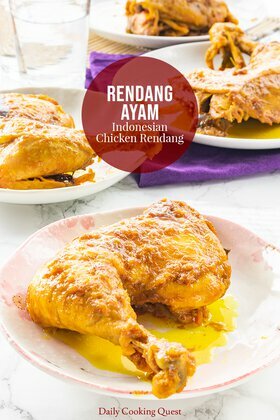 This recipe for ayam goreng rica-rica - tomato & chili fried chicken is a tone down version from the original. Trust me, you need to build up your body tolerance before trying an authentic rica-rica! The most obvious thing that will jump up when you encounter a true rica-rica dish is the absurdly insane amount of Thai bird eye chilies that greet your eyes. A super authentic recipe commonly calls for something in the order of 20-30 chilies! I’m going to chicken out and use only 2 in this recipe. To make up for the lack of red color from using only 2 chilies, I am compensating with 3 tomatoes, otherwise the color will be super off. You will also need shallot, garlic, scallions, salt, and sugar. 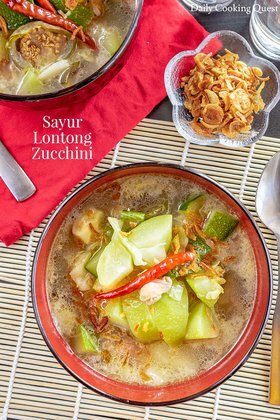 If you wish, you can also add a lemongrass and a couple of kaffir lime leaves, but the dish is more than acceptable even without these two ingredients. This is at least my 10th post using the same fried chicken recipe. 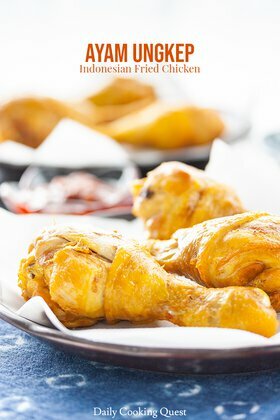 If you follow my recipes, you probably have memorized it by heart :) As always, I prefer deep frying the chicken strips. But if you really must use oven, please refer to my orange hoisin chicken stir fry recipe to oven “fry” chicken strips. Mix together chicken with bruised garlic, lime juice, and salt. Then let rest for 15 minutes. Whisk together all purpose flour, tapioca starch, and salt. Toss the chicken into flour mixture to fully coat. There shouldn't be any standing liquid at all at this point. Heat enough oil in a wok/pot for deep frying. Once the oil is hot enough (it should looks shimmering and runnier), add the coated chicken pieces, in batches if needed, and fry until golden brown. Set aside over a wire rack while we prepare the sauce. Heat oil over medium high heat in a wok or large frying pan. Sauté shallot, garlic, lemongrass (if using), and chilies until fragrant. About 3 minutes. Add tomato cubes, season with salt and sugar. Stir until tomato starts to wilt. Return fried chicken strips along with scallion and kaffir lime leaves (if using) to wok/frying pan. Gently toss until coated evenly. 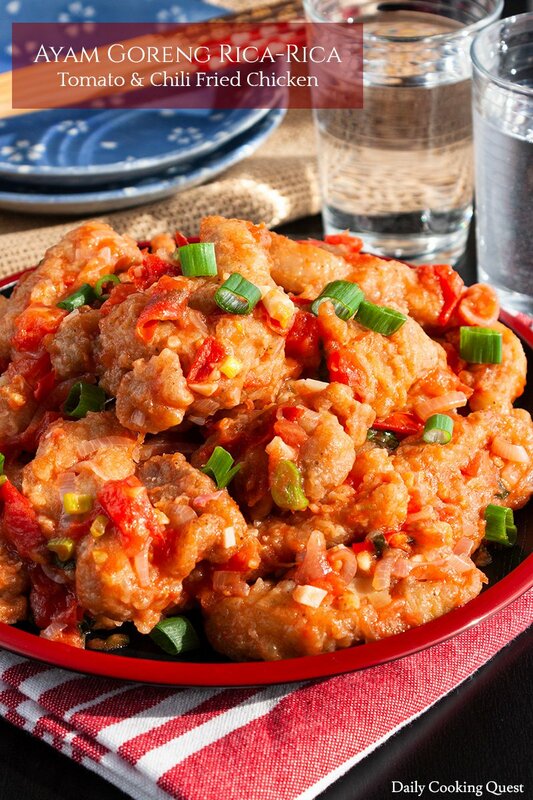 Turn off heat, transfer to a serving plate, and serve immediately with steamed white rice. 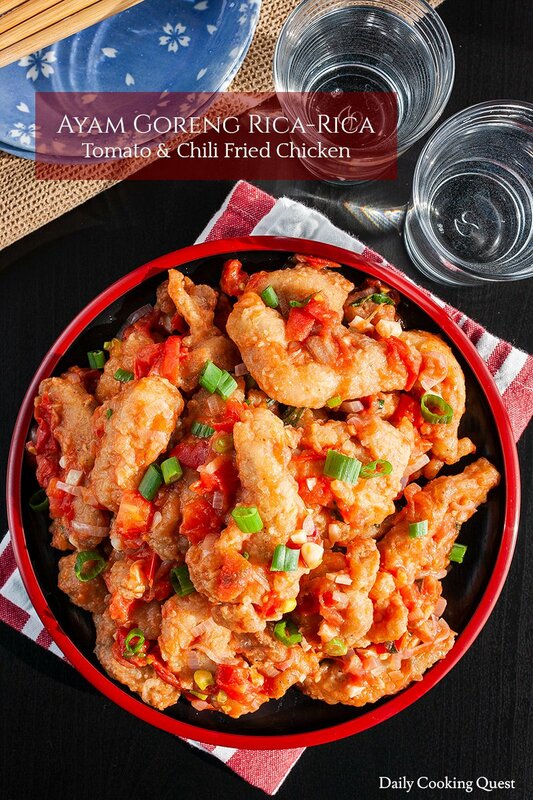 (*) To reduce the level of spiciness, you can also use red fresno chilies. If you want a more authentic rica-rica experience, you can add up to 20 Thai red bird eye chilies. Hi Anita, Your photo looks amazing.. Can you share some tips to take a beautiful food photography? Do you live in the USA? 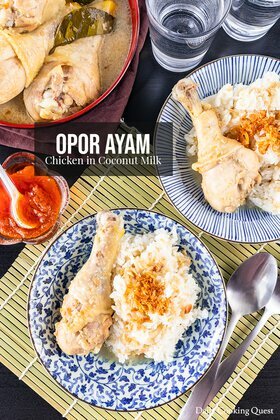 is it hard to find some Indonesian ingredients? Hi Steven, thanks for the compliment! Hm... I would say try to follow some basic photography courses, and then, follow with some tips specifically for food photography. There are tons of good video tutorial in Youtube. If you have access to lynda.com, it has so many good photography courses too. 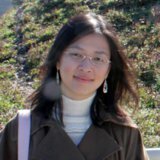 A website like http://www.learnfoodphotography.com/ can be a very good primer for a total newbie, especially if you need a more thorough guide, and it's completely free. And lastly there is just nothing like unending practice. Yes, I live in the US, and it certainly can be tricky to find Indonesian ingredients. I used to live around SF Bay Area, and it was super easy to find almost anything I need. Now that I live in the Mid West, it has been harder to find certain things. I can still find most of the ingredients online, but usually more expensive compared to brick-and-mortar shops. Hello and regards from Jayapura - Papua. Rica rica chicken was my dinner just tonight in one of the restaurants by amazing Sentani Lake. Obviously the mild version. But I highly reccommend this recipe to try. A must for all chilli lovers. Thanks for trying out the recipe :) Wow, you have probably seen more of Indonesia than me, Pavol. I have yet to visit Papua.